President Donald Trump officially recognized Jerusalem as the capital of Israel on Wednesday and directed the State Department to begin moving the American Embassy, as the Wall Street Journal’s Felicia Schwartz reports. Dive Deeper : CSIS's Bulent Aliriza has a commentary, "Trump’s Jerusalem Decision: Erdogan Leads the Muslim Reaction." President Trump today called on Saudi Arabia to allow food, fuel, water, and medicine to reach the people of Yemen, in a statement that reflected the growing alarm of relief agencies and amounted to an unusually harsh public scolding of one of his administration’s closest allies, as the Washington Post’s Max Bearak reports. President Vladimir V. Putin announced on Wednesday that he would seek a fourth term as president of Russia in a March election that he is expected to win handily, as the New York Times’ Neil MacFarquhar reports. Of the 102 events at the forthcoming Pyeongchang Olympic games, Russia’s athletes had finished in the top five of the world championships in 32 events. Source: New York Times. — President Trump. Source: Politico. 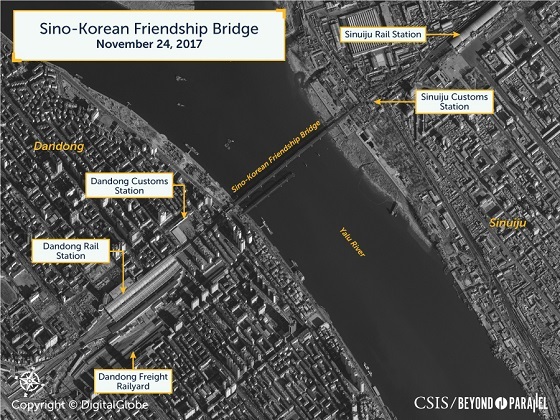 CSIS Beyond Parallel released images and analysis of the Sino-North Korean Friendship Bridge, a crucial conduit for commerce that reportedly carries approximately 70% of the trade between the two countries. (Photo credit: Chip Somodevilla/Getty Images.) 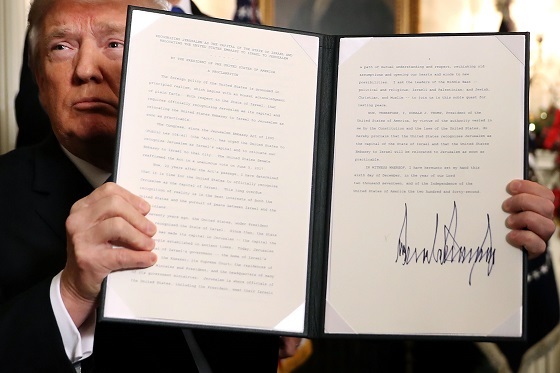 President Trump holds up a proclamation that the U.S. government will formally recognize Jerusalem as the capital of Israel after signing the document in the Diplomatic Reception Room at the White House today. “Why the U.S. Considers North Korea’s Kim a ‘Rational Actor,” by the Wall Street Journal’s Nancy Youssef. Join the CSIS International Security Program at 8:30 a.m. for a discussion with Representatives Coffman, Gallego, Bacon, and Panetta on their proposal for a new Authorization for the Use of Military Force. At 2:00 p.m., join the CSIS Energy and National Security Program for the U.S. launch of OPEC’s World Oil Outlook 2017. Join the Wilson Center at 11:00 a.m. for a conversation with Ambassador Richard Verma on U.S.-India relations, focusing on the opportunities and challenges of strengthening the relationship. And, at 2:30 p.m., join the United States Institute of Peace for a discussion on China’s impact on global development and conflict. The CSIS Aerospace Security Project visualized North Korea’s most recent missile launch. The latest episode of Energy360 dives into the future role and efficacy of sanctions in the energy sector. The complex challenges posed by Iran, Russia, Venezuela, and North Korea and the debate around appropriate sanctions regimes for each are also analyzed. Elvis Presley may not have invented rock and roll in the 1950s, but he embodied it. Along with Jerry Lee, Elvis was one of the first performers that made rock popular, cool, and even a bit dangerous. My favorite Elvis performance is his 1968 live comeback special. Clad in black leather with a full duck-tail haircut and long sideburns, this icon version of Elvis ignited the stage and the small screen. Television could barely contain Elvis—he was truly larger than life.